Box Text: HUMANITY'S LAST HOPE IS ONE BIG CATFIGHT! Fighting games have never been hotter than this all-girl arcade hit from Japan. These beautiful but deadly girls will rock you with insane combos, homing techniques, and astounding vertical fighting power. Rain down punishment fromt he skies on some of the largest battle maps in 2-D fighting history. Select from 11 Maidens and 11 Arcana to create a fighter that suits your play style. It's all here: Arcana heart, the remixed Arcana Heart FULL, 4 play modes, and unlockable Gallery content. 07-15-2014 kwisatzhaderach Box Text HUMANITY'S LAST HOPE IS ONE BIG CATFIGHT! Fighting games have never been hotter than this all-girl arcade hit from Japan. These beautiful but deadly girls will rock you with insane combos, homing techniques, and astounding vertical fighting power. FRANTIC AERIAL ACTION Rain down punishment fromt he skies on some of the largest battle maps in 2-D fighting history. 121 FIGHTER COMBINATIONS Select from 11 Maidens and 11 Arcana to create a fighter that suits your play style. 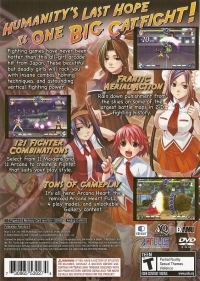 TONS OF GAMEPLAY It's all here: Arcana heart, the remixed Arcana Heart FULL, 4 play modes, and unlockable Gallery content. 01-21-2013 desocietas Box Text HUMANITY'S LAST HOPE IS ONE BIG CATFIGHT! Fighting games have never been hotter than this all-girl arcade hit from Japan. These beautiful but deadly girls will rock you with insane combos, homing techniques, and astounding vertical fighting power. FRANTIC AERIAL ACTION Rain down punishment fromt he skies on some of the largest battle maps in 2-D fighting history. 121 FIGHTER COMBINATIONS Select from 11 Maidens and 11 Arcana to create a fighter that suits your play style. TONS OF GAMEPLAY It's all here: Arcana heart, the remixed Arcana Heart FULL, 4 play modes, and unlockable Gallery content. 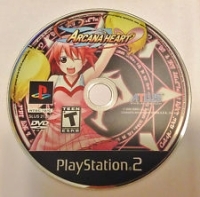 This is a list of VGCollect users who have Arcana Heart in their Collection. This is a list of VGCollect users who have Arcana Heart in their Sell List. 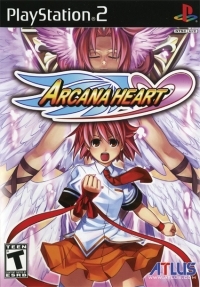 This is a list of VGCollect users who have Arcana Heart in their Wish List.